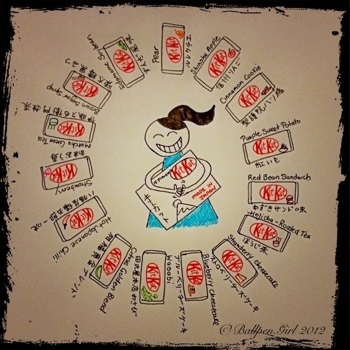 Yes, it’s the never ending search for Kit Kats from Japan… Fortunately, my brother’s travels to one of my favourite country, Japan makes it possible. I am sure there are people out there who knows exactly what I am talking about!! The sight of a new Kit Kat flavour, however weird or bizarre is so exciting!! This time I got a special box pack containing 15 different flavours! Despite it containing some of the flavours I have already tried, I am still so happy with 9 new flavours and can’t wait to taste them all! I guess I better start tasting during the ‘festive’ season before the new year resolution of going back on diet starts!! hehehe….